Home / Humble student of the markets / How much do the bulls have left in the tank? Mid-week market update: Happy 2019 to everyone. The post-Christmas period started off with a bang. After bottom out on December 24, the stock market enjoyed four consecutive days of gains – until today when it was spooked overnight by a series of disappointing PMI prints. 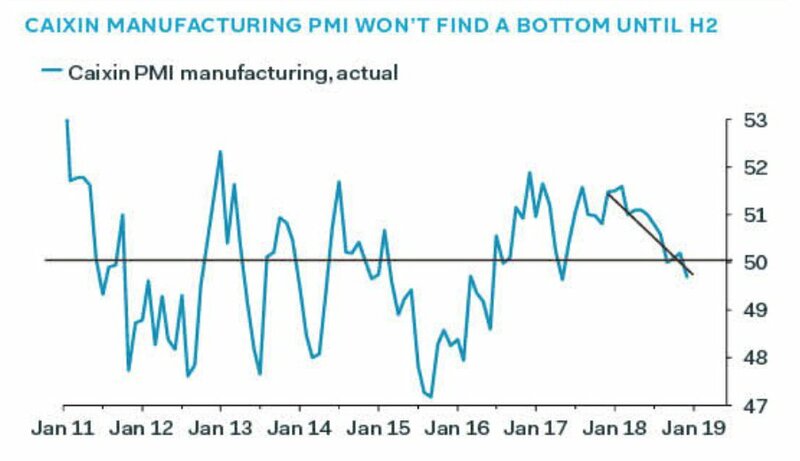 The Caixin Manufacturing PMI fell to 49.7 from 50.2 (50.0 expected), indicating contraction. As a reminder, the Caixin PMI differs from China`s official PMI as the Caixin measures mostly the activity of smaller companies, while the official PMI measures the activity of larger SOEs. Beijing has responded to past episodes of weakness with a stimulus program, but the stimulus announced so far has been underwhelming, as it has consisted mostly of targeted tax cuts. Anne Stevenson-Yang of J-Capital observed that China lacks the debt service ability for another round of shock-and-aw credit-driven stimulus. 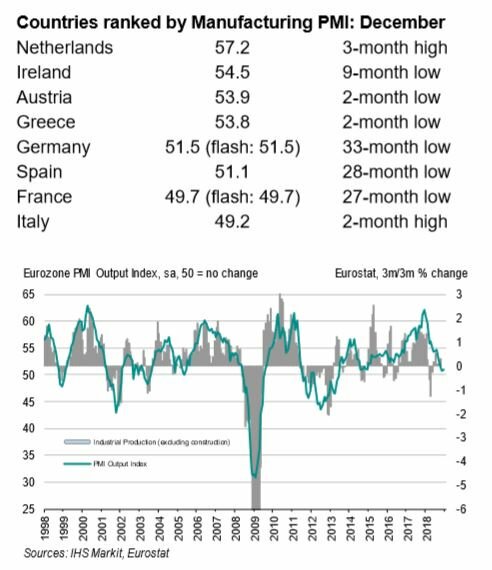 The market was further hit by the news of weakness in eurozone M-PMIs, indicating deteriorating European growth. The outlook for the core European countries of France and Germany stand out as particularly problematical. While the disappointing PMI figures put stock prices under pressure at the open, the bulls must have been encouraged by the intra-day recovery to see the market close only slightly negative on the day. The relief rally of the last few days appears to be playing itself out. 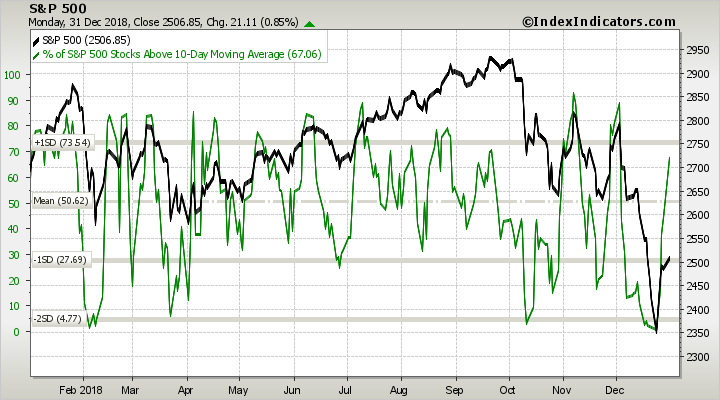 The market had moved to a deeply oversold condition, and began to rebound on December 26. Subscribers received an email alert that I was selling all of my long positions and reversing to the short side in my trading account. Despite the market recovery during the day, the SPX has broken down out of a rising wedge on the hourly chart. The path of least resistance in the near-term is down. 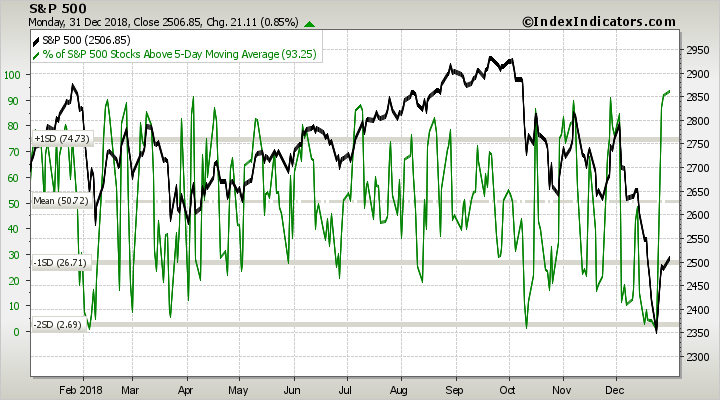 Short-term breadth (1-2 day time horizon) had become overbought (readings are as of the close Monday). Longer term (3-5 day horizon) had recovered to a near overbought level, and the 2:1 advance-decline breadth today will extend the reading closer into the overbought territory. V-shaped bottoms are rare. A more likely scenario is a low, rally, and then a decline to re-test the previous low. The re-test may see an undercut of the old low, but the key indicator to watch will be whether momentum indicators such as RSI flash positive divergence signals. The current news backdrop is extremely fickle, and the markets have been understandably jittery. Nothing goes up or down in a straight line. Prepare for some short-term downside volatility.